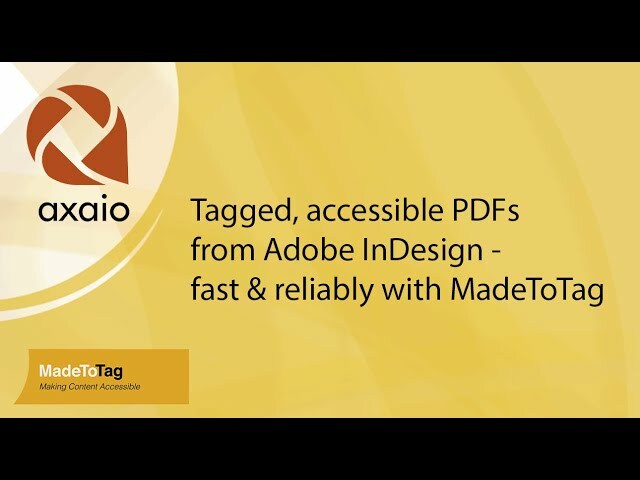 axaio MadeToTag is an Adobe InDesign CS5.5, CS6 and CC plug-in to properly prepare InDesign documents for export as accessible, tagged PDF file – easy, fast and reliable. The MadeToTag UI allows step-by-step guidance and this seven step guide leads any customer safely and intuitively through the procedure of generating tagged PDF files, without missing any important step. MadeToTag update 1.9.088 available, also for CC 2018! Properly tagged PDF files have become very important for public administrations and enterprises. Legal requirements for physically impaired people and for accessibility in the information technology (such as described in the German BGG, BITV and EU mandate 376) impose that the public sector offers all content – webpages as well as PDF documents – in an accessible form. But also media service providers, representatives of associations and institutions as well as students and lecturers at colleges and unversities increasingly consider it their duty to have their written materials available as accessible documents. Nothing simpler than that with MadeToTag. Tables can be tagged as "layout table"
Alternate text overview saves edited text on scrolling. Temp copy of doc while export has better name for identification. Temp copy of doc does not show in recent files list. Meta data: title + author only one line, apply + update improved. Minor changes on PDF Bugfixing. Debugging: when folder "debug" is placed inside of "MadeToTag" in preferences folder then all created files during PDF export are copied to this folder. At the VIP Event 2017, René Treuber (Product Manager of axaio) talked about the new features in MadeToTag. 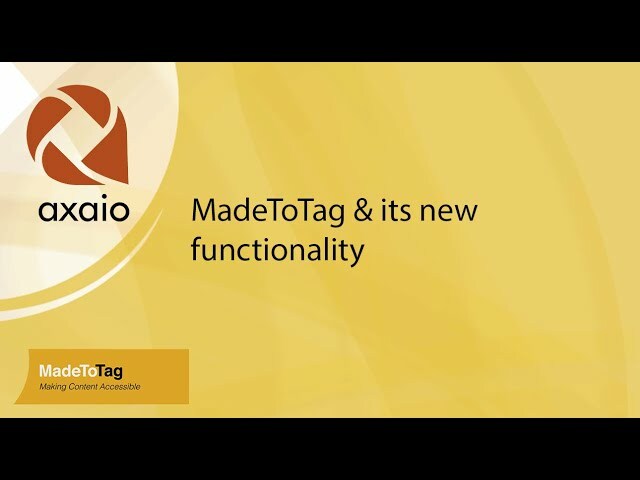 This video shows the new MadeToTag feature "form field optimization". Olaf Drümmer, CEO at axaio software, explains in this webinar how MadeToTag makes editing documents and form fields more comfortable, faster and thus more efficient. 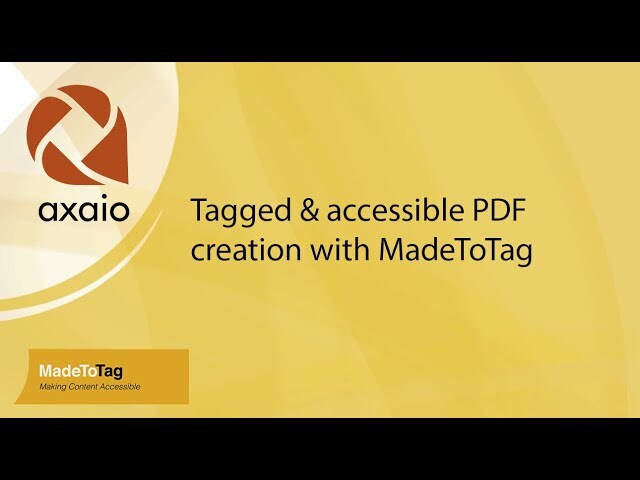 MadeToTag features an UI, which allows step-by-step guidance through tasks for creating accessible, tagged PDF files. This new concept offers a better overview of the necessary tasks and provides a higher level of control. Content order in exported PDF matches reading order. Alternate text is provided for non-text elements (for example images). Metadata is provided for the document (like the document title). Export tags are associated with paragraph styles and represent semantic labels (also referred to as “tags”) used to indicate the type of the parts of a document’s content, like whether a piece of text is a paragraph or a title. In order for export tags to work well, paragraph styles have to be used consistently across the document. For paragraphs and headings, export tags have to be assigned by the user. For lists, tables and tables of contents, InDesign automatically creates the correct tags when exporting to PDF, but only if the respective features of InDesign are used. Make sure you have enabled keyboard MadeToTag short cuts at the bottom of the MadeToTag panel. Put the text cursor inside a paragraph for which you wish to assign an export tag. Press Option-”1” for a heading level 1, Option-”2” for a heading level 2 etc. or Option-”7” for a paragraph. In order to remove an export tag from a paragraph style, press Option-”0” (Option-“zero”). If a paragraph style is used for decorative parts (artifacts) of the document’s content, use Option-”9” – but use this with care as all content inside paragraphs associated with the artifact export tag will not be an accessible part of the content structure in the exported PDF. There is no need to set an export tag for lists or a table of contents generated by InDesign – just leave the export tag at “automatic”. For tables, the content in table cells is formatted as any other text content, for example as a regular paragraph or a list. Please avoid headings inside tables as this is usually not adequate. Instead, header cells in a table are configured through the table setup in InDesign. Headings are highlighting by an orange color (darker orange for heading level 1, increasingly lighter for the heading levels below it). Paragraphs are highlighted by a blue color. Lists are highlighted by green. Paragraphs representing artifacts are highlighted by a red color. InDesign comes with a feature called “articles” – accessible through the “Article” panel – which makes it possible to organize the content of an InDesign document in a sequence of “articles”, each containing a sequence of frames defining the order of the document’s content, in the order it will usually be consumed by a reader. 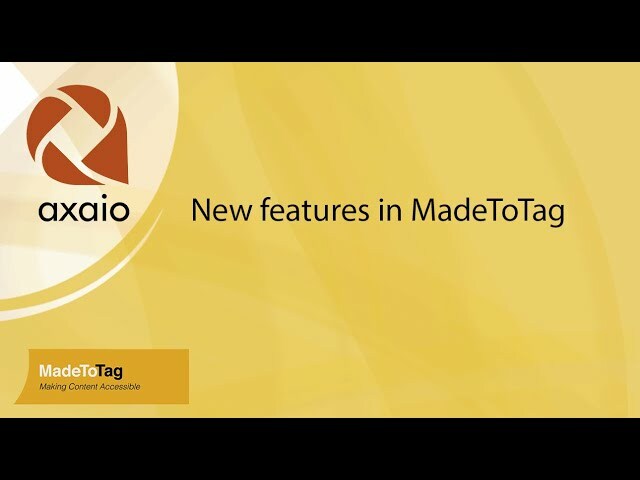 Make sure you have enabled the MadeToTag short cuts at the bottom of the MadeToTag panel. Make sure you have the “Articles” panel open while organizing your content into articles. Select a frame that shall become the first content object in a new article, and press Command-“N”, enter a name for the article, and press OK – as you can immediately see in the “Articles” panel, this will create a new article. Select a frame that shall be added to the current article as the next part of that article’s content and press Command-“A” – as you can immediately see in the “Articles” panel, this will add the currently selected frame to the current article. Once a frame from a text chain is associated with an article, the whole text chain is associated with the article, including all anchored frames in it. Frames on master pages cannot be associated with articles; in order to associate frames on a master page with an article, they first have to be turned into regular frames. MadeToTag offers various possibilities to temporarily hide or show frames, depending on whether they are associated with the current article or any article or not. For example the short cut Command-Shift-“X” hides all frames already associated with the current article, to make it easier to identify frames that still have to be associated with that article. The available possibilities can be found in the fly out menu of the MadeToTag panel. In order to check and review the content order and semantic structure of an article, use the “Show preview” feature (shortcut: Command-Shift-“V”). The MadeToTag preview feature will display a new window containing a stylized structural view of the content of the current article. For creating an overview of the whole document, including all its articles, use “Preview for all articles” (shortcut: Command-Shift-“B”). In order to make the content of a PDF file to users with certain disabilities, loss of vision, low vision or learning disabilities, it is essential to provide a text equivalent for non-text content like images. Use the “Go to next frame without alternate text” button in the MadeToTag panel – the next image frame that does not yet have alternate text will be centered on screen and be selected; just enter the alternate text in the text field in the MadeToTag panel and click “Apply”. Use the “Show overview” button in the MadeToTag panel to display a list of all image frames in the document, optionally displaying only images for which alternate text still has to be provided; just go to the text field to the right of the respective image and enter the alternate text. In order to review the alternate text in the context of the surrounding content, simply use the article preview feature, by pressing Command-Shift-“V” for a structural preview of the current article, or Command-Shift-“B” for a structural preview of all articles. The MadeToTag panel provides a view of the most important metadata fields (for a dialog offering access to all metadata fields, use InDesign’s “File Info” feature). In order to make an exported tagged PDF accessible it is important to at least provide a meaningful document title. Further fields can be filled out as suitable. In order to enable proper speech synthesis for text-to-speech – e.g. when accessing PDF documents with a screen reader program, or when converting PDF content to an audio file or audio stream – it is important that all text in the PDF document is marked with the correct language. In InDesign this can be controlled through a language setting in the paragraph and character styles. Correct language settings also have the advantage to enable suitable hyphenation and spell checking. The prevalent “Primary language” is highlighted by a pastel red color. The second and third languages are highlighted using pastel green and pastel blue. Any further languages are combined into one group of “Other languages”, highlighted in pastel pink. When an unwanted language needs to be located, the navigation buttons under each language popup menu can be used to go to the first, previous, next or last occurrence of that language in the InDesign document. Change the language for the paragraph style associated with the currently selected text, by using the respective menu items – or keyboard shortcuts – under the “Export tags | Language” fly out menu in the MadeToTag panel. Change the language for the character style associated with the currently selected text, by using the respective menu items – or keyboard shortcuts – under the “Export tags | Language” fly out menu in the MadeToTag panel. Change the language for the currently selected text by using the respective menu items – or keyboard shortcuts – under the “Export tags | Language” fly out menu in the MadeToTag panel. In order to set the language for selected text to languages other than the primary, second or third language, use the “Set language for current text” pop-up menu in the MadeToTag panel to set the language as local formatting. Furthermore, all the language options built into InDesign for setting the language of text and paragraph or character styles of course remain available. MadeToTag makes it possible to tag tables for advanced navigation support. The main purpose of this function is to differentiate table headers from regular table cells (often referred to as data cells). This involves using the headers as defined in InDesign when creating the table. This is limited to column headers, row headers are not supported in this mode. Quick Headers are expressed as the number of row headers and the number of column header. The values can simply be entered in the corresponding fields. It is also possible to specify which cells should be tagged as header cells using the “Activate Smart Headers editing mode” button. The cursor can be used to select table cells. These are then highlighted in green. The selected table cells can then be associated with other cells in the table to establish a parent child relationship, where each parent cell serves as a header cell for the associated child or children. These relationships can be nested - a cell can serve as a header cell for some other header cell, which serves as the header for some data cells. For this to function, the geometric position of the cells in the table grid is not relevant. Thus the Smart Header function can be used to set up even complex, possibly nested relationships between header cells and data cells. Select a cell in a table (make sure that “Smart Headers editing mode” is activated). The cell will be highlighted in green with a dotted border around it. Link a cell as a child cell to it by Command-clicking on that cell. The now linked child cell will be filled with a blue colour. When selecting a cell to become a header cell, or when Command-clicking to link a cell as a child cell, it is also possible to do a click-drag or Command-click-drag, to select several cells to become header cells, or to link several cells a child cells. The linking of child cells to header cells can be nested, it is thus possible to make a cell the header cell of some other header cell, which in turn is the header for a date cell. In order for Smart Header to function the position of cells in a table grid is irrelevant; nevertheless tables still need to be constructed in a fashion that can be understood and makes sense. Starting from a selected cell it is also possible to link some other cell as a parent - just hold down the Shift key while doing Command-click. When the Shift key is pressed, Command-click-drag is not supported - only one parent cell at a time can be linked to one or more selected cells. Export document as “Spreads” (versus “Individual pages“). Define image data handling (target resolution, compression). After exporting the PDF it is recommended to review the tagging structure in the exported PDF with the free callas pdfGoHTML plug-in (requires Acrobat 9, X or XI for Mac or Windows), a joint development by axaio software and callas software, and available for download from www.callassoftware.com.